Figure A1-1. Aegean anomaly, interpreted as the Aegean slab, with (horizontal) [vertical] cross sections through (A)[D] the UUP07 p-wave) and (B)[D] the combined SL2013 and S40RTS s-wave models at 850 km; C) the location of the modern geological record that we interpret to have formed during the subduction of the slab. The Aegean anomaly (Figure A1-1) was previously called ‘Aegean Tethys’ by van der Meer et al. (2010) and is located below south-east Europe from the deep lower mantle up to the surface at the Hellenic subduction zone. It was one of the first slabs imaged (Spakman et al., 1986a;1988; 1993) and is widely interpreted as a slab that represents north-dipping African lithosphere (e.g. Spakman et al. 1988; De Jonge et al., 1994; Piromallo and Morelli, 1997; 2004; Bijwaard et al., 1998; de Boorder et al., 1998; Faccenna et al., 2003; van Hinsbergen et al., 2005; 2010; Hafkenscheid et al., 2006; Chang et al., 2010; Biryol et al., 2011). Van der Voo et al. (1999b) identified this slab as the II anomaly, and Hafkenscheid et al. (2006) called it the ‘Gr’ anomaly, with both papers identifying that the slab deeply penetrates the lower mantle. Where Faccenna et al. (2003) initially interpreted the mantle below the Aegean slab to host a single slab that folded and overturned in the lower mantle, van Hinsbergen et al. (2005) suggested that there are actually two two slabs below the Aegean: A deep anomaly between ~2000 and 1500 km, and an anomaly from 1500 km to the surface, associated with continuous northward subduction of oceanic and continental lithosphere, upper crust which accreted to form the Aegean mountain belt on basis of the geological record of the Aegean region, where three separate subduction records are found: A Jurassic – Early Cretaceous record emplaced ophiolites westward and northeastward suggesting two oppositely dipping subduction zones of this age. The northeastern one we associate with the deeper Aegean slab (See Emporios slab), and the western with the Algeria slab to the west. Van der Meer et al. (2010) included the East Vardar and Aegean slabs both in the Aegean Tethys slab and assigned an age range of mid-Jurassic to Present. Because the subduction of both slabs can be clearly separated in the geological record, we separate these into two separate lithospheric bodies. For the Aegean slab we avoid the addition “Tethys” because a considerable part of the subducted lithosphere is of continental origin rather than the oceanic nature of the Tethys (van Hinsbergen et al., 2005; 2010). The onset of northward subduction of the Aegean slab must have started after the emplacement of the East Vardar ophiolites in the early Cretaceous (~130-120 Ma (Schmid et al., 2008)) (See Emporios slab), and before the onset of arc volcanism in the Sredna-Gorie belt of southern Bulgaria starting around 92 Ma (Stoykov et al., 2004; Quadt et al., 2005; Zimmerman et al., 2007), and is generally considered to occur around ~110±10 Ma (e.g., Faccenna et al., 2003; van Hinsbergen et al., 2005; 2010; Schmid et al., 2008; Jolivet and Brun, 2010). 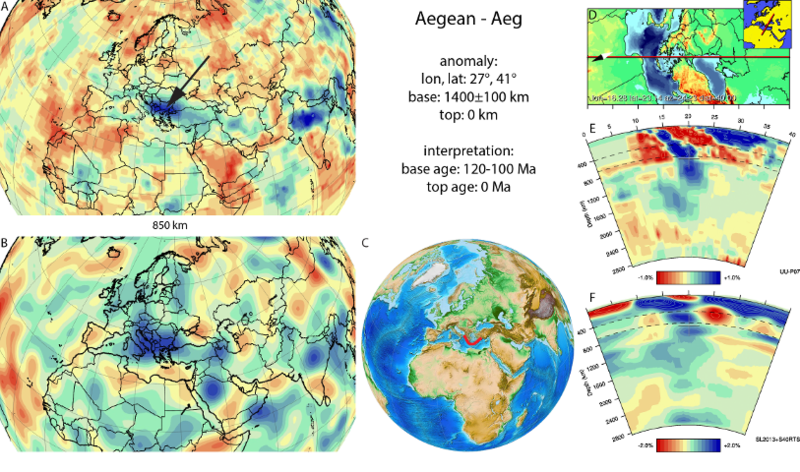 Subduction of the Aegean slab is still continuous at the Hellenic trench, and seems in the upper mantle laterally disconnected to slabs under western Anatolia (de Boorder et al., 1998; van Hinsbergen et al., 2010; Biryol et al., 2011) Figure 6). 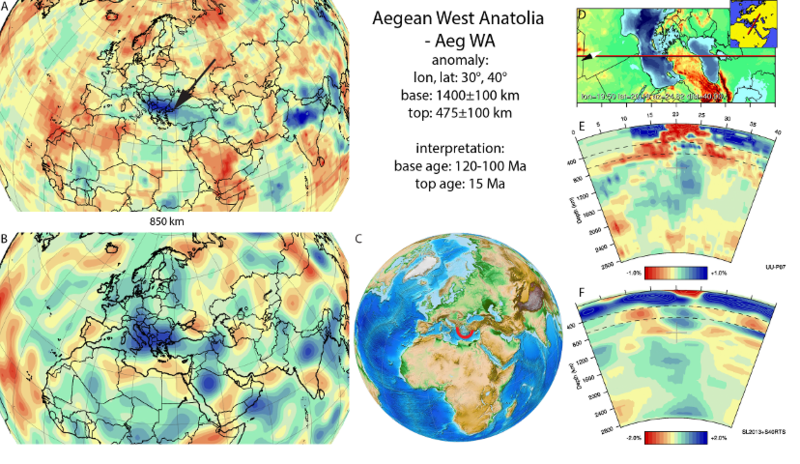 Based on a kinematic reconstruction of western Turkey, the timing of break-off of the Aegean slab below Western Anatolia was estimated at ~15 Ma (van Hinsbergen, 2010; van Hinsbergen et al., 2010). Figure A1-2. Aegean anomaly below west Anatolia, interpreted as the Aegean slab, with (horizontal) [vertical] cross sections through (A)[D] the UUP07 p-wave) and (B)[D] the combined SL2013 and S40RTS s-wave models at 850 km; C) the location of the modern geological record that we interpret to have formed during the subduction of the slab.